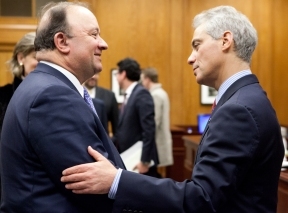 On Thursday, Mayor Rahm Emanuel welcomed the Colombian Ambassador to the United States, Luis Carlos Villegas, to Chicago. Mayor Emanuel met with Ambassador Villegas along with other Colombian trade representatives to discuss the state of U.S. – Colombia relations, developments in the Colombian economy, and ways to advance trade and investment partnership with Chicago. Colombia has long been a strong trading partner with the State of Illinois, importing $448 million of Illinois goods in 2013 alone. Since 2009, the City of Chicago has been sister cities with Bogota, Colombia. Appointed in November of 2013 by President Juan Manuel Santos, Ambassador Villegas served most recently as President of the National Business Association of Colombia. The meeting follows a series of recent trade-missions undertaken by Mayor Emanuel in order to boost Chicago’s position in the global marketplace, including visits to China and Mexico.